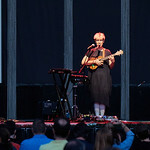 The "Summer of FUV" concert series drew to a close on September 15 with one more live broadcast from Forest Hills Stadium, featuring two exceptional artists attuned to both rhythm and resistance: David Byrne and Tune-Yards. Byrne's concert — archived here — was a homecoming of sorts, complemented by Tune-Yards' Merrill Garbus, whom he worked with a handful of years ago on Contemporary Color, celebrating the art of color guards with the songs of ten musicians, including St. Vincent, Blood Orange's Dev Hynes, and Lucius. 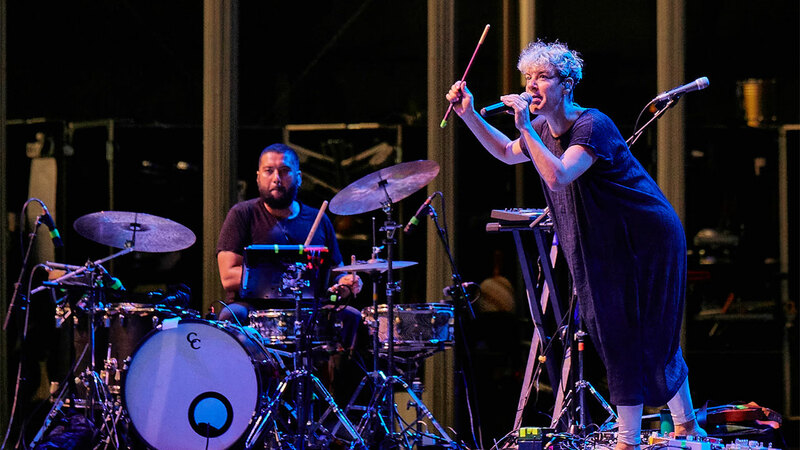 Three years after Contemporary Color, Garbus and her Tune-Yards bandmates have been on the road with Byrne on this leg of his 2018 tour, supporting his latest album, American Utopia. Tune-Yards have their own new album too, I Can Feel You Creep Into My Private Life, the band's fourth album and their first in four years. Tune-Yards' energetic 45-minute set drew heavily upon songs from that new album, which boldly examines race and identity. Garbus, standing barefoot in front of a massive arsenal of looping pedals, effects, samplers, and a controller, deftly switched between drumsticks and her ukulele. She was accompanied by her longtime collaborator, bassist Nate Brenner, and drummer Hamir Atwal, who delivered infectious worldbeat, hip-hop, and disco rhythms and beats. Only two songs in the set looked back to earlier releases: “Water Fountain” from 2014’s Nikki Nack, and "Gangsta" from Tune-Yards' second album, whokill. 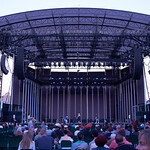 Garbus said few words during the set, but she did remind the audience that the band was there to warm up everyone for David Byrne. As she put it, music is that much better when we move our bodies and dance. And indeed, Tune-Yards' set ended with an all-out dance party to a thumping, extended, and exuberant version of “Heart Attack”.